P2X2 receptor is an ATP-activated ion channel which is widely expressed in the nervous system, and mediates synaptic transmission. We recorded currents of P2X2 receptors expressed in Xenopus oocytes from outside-out patches and have found that currents recorded from patches containing a single or multiple P2X2 channels differ in a manner suggesting positive cooperativity. First, the currents from multichannel patches exhibit simultaneous transitions more frequently than predicted from the activity of independent channels. Second, the mean open lifetime at the current level of a single channel in a multichannel burst is about six times longer than the open time of currents from single channel patches, a trend opposite to what is expected of independent channels. These results indicate that the channels have positive cooperativity and that the longer opening is due to a slower closing rate. Third, from kinetic analysis the likelihood of the cooperative model is significantly larger than that of the independent model. Fourth, the open channel noise of currents from patches containing multiple channels is less than half that from a single channel, which is consistent with the channel properties being different when they are active in groups. Taken together, our results suggest that P2X2 receptors are non-independent, but interact with positive cooperativity. ATP functions as a neurotransmitter in the central nervous system [1–3]. Synaptically released ATP acts on a class of ligand-gated ion channels called P2X [4–7]. While the dynamics of these channels have been studied [8, 9], a common assumption is that the channels are independent. This paper questions that assumption. Patch-clamp techniques  made it possible to observe directly the conformational changes of a single channel, but there are usually multiple channels in a patch. If the channels behave independently and are not too abundant, the mathematics and analysis of the data is straightforward http://www.qub.buffalo.edu. However, the assumption of independence is rarely tested, and may be wrong. Functional interactions between channels have not been studied intensively but data do exist showing cooperativity . The presence of cooperativity changes the significance of expression density. 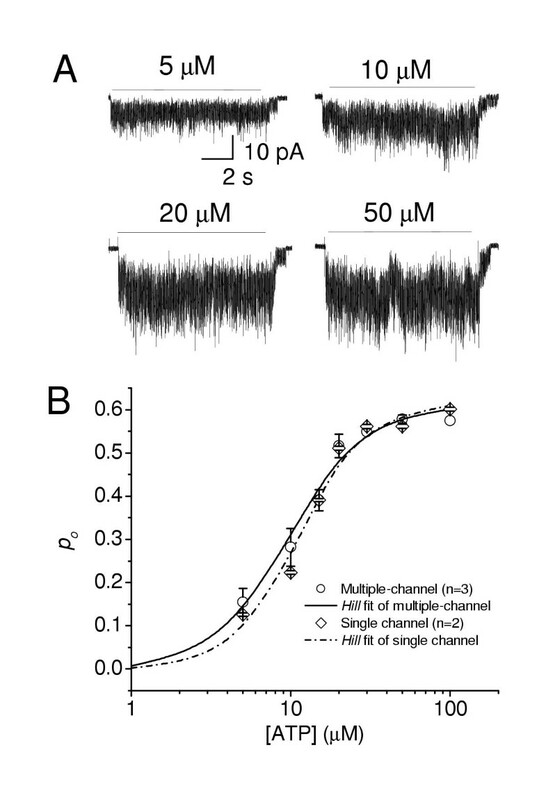 Homomeric channel interactions have appeared as an excess of multiple openings (relative to independent channel expectations) in K+ channels  and acetylcholine receptors [11, 13–15]. Interaction between heterologous channels has also been demonstrated between Ca2+ and Ca2+-activated K+ channels  that may be explained by intracellular accumulation of Ca2+ near closely spaced channels. Nicotinic acetylcholine receptors also interact with P2X2 receptors  via unknown mechanisms. 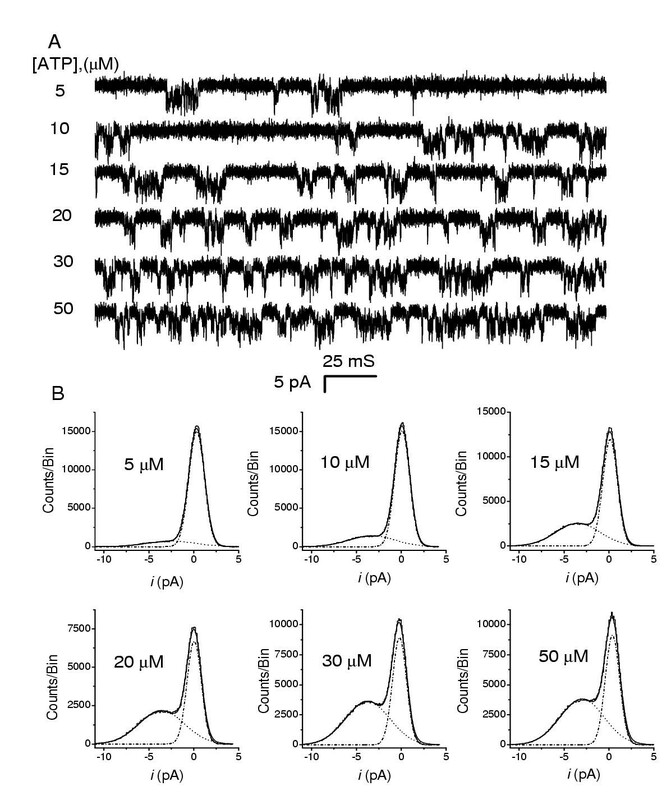 In our previous papers [18, 19] we studied the open channel and gating properties of P2X2 receptors. The data for these kinetic analyses were obtained from the patches containing a single channel. Here, we report discrepancies between single channel and multiple channel currents. Analysis from open channel lifetimes, open channel noise and kinetics indicate that the receptors are not independent, but have positive cooperativity. Figure 1A shows typical multiple channel currents activated by 10 μM ATP at -120 mV recorded from an Xenopus oocyte. 10 μM ATP is about equal to EC50 value. Since we did not see open level more than 3 channels from entirely record, we think the patch contained at least three channels. As indicated by arrows, there are many simultaneous closing and open transitions. These concurrences of openings and closings are highly suggestive of channel interactions since independent channels would have less clustering . We observed this phenomenon in all seven multiple-channel patches. Typical current from a multiple-channel patch. (A) The outside-out patch current activated by 10 μM ATP recorded at -120 mV from a Xenopus oocyte. The data were sampled at 10 kHz and filtered at 5 kHz. There are at least three channels active in this patch as indicated by the open level of current. There are a surprising number of what appear to be nearly simultaneous openings and closings, some of which are marked by arrows. These occurrences are the indication of channel interactions. The convention in this paper is that inward currents are downward. (B) The all-points amplitude histogram of currents from panel A (0.15 pA/bin). The distribution was fit by a sum of four Gaussians (lines), with means of 0, 4.1, 7.9 and 11.9 pA, representing the closed, 1st, 2nd, and 3rd open levels. The open channel noise of each level was ~1.2 pA. The probabilities, P(k)exp, that all channels are closed, one, two, and three channels are open from histogram are 0.210, 0.487, 0.270, 0.027, respectively in this patch. (C) Comparison of P(k)exp with P(k)binomial from the binomial distribution (Eq. 5). The ratio of P(k)exp/P(k)binomial increases with increasing k.
We estimated the channel amplitude by fitting amplitude histograms (Figure 1B) with four Gaussians representing the closed, 1st, 2nd, and 3rd open level. The mean current of the states was 4.0, 7.9 and 11.9 pA, respectively. The mean open channel noise/channel was ~1.2 pA with a 5 kHz bandwidth (estimated from the standard deviation of the Gaussians), a value ~30 % of the mean open channel current amplitude (also see Figure 3D). Since the amplitude and open channel noise of the different open levels are essentially the same, the conductance properties appear identical. Dose-response curves of currents from multiple- and single channel patches. (A) Multiple channel currents activated by different ATP concentrations at -120 mV. The data were sampled at 10 kHz and filtered at 5 kHz. The bar indicates the application of ATP. (B) The dose-response curve of multiple channel currents (Circles, n = 3) and single channel currents (Diamonds, n = 2) recorded from outside-out patches. The multiple channel currents were normalized to the peak value of currents activated by 100 μM ATP and rescaled to the same po,max as the single channel current. po of single channel currents (Diamonds) were calculated from the all-points histogram (see Figure 4). The solid line is a fit of the Hill equation of multiple channel currents with an EC50 of 9.8 ± 0.8 μM and a Hill coefficient of 1.91 ± 0.29. The dash-dot line is the fit of the Hill equation of single channel currents with an EC50 of 11.2 ± 1.0 μM, a Hill coefficient of 2.3 ± 0.44, and po,max of 0.61. Mean open channel lifetimes of currents from multiple channel currents and single channel currents. The currents were recorded from Xenopus oocytes at -120 mV in divalent free perfusion solutions and were sampled at 20 kHz and filtered at 5 kHz. (A) Single channel current (left) shown with the idealized current above and the histogram below. The mean amplitude and open channel noise are 4.1 pA and 2.4 pA. (B) Currents from a patch containing two channels (left) with the idealized currents shown above and the histograms below. The mean amplitude and open channel noise are 4.8 pA and 1.5 pA. (C) Mean open lifetimes of currents from patches containing one (n = 6), and two (n = 4) and three (n = 5) opening levels. (D) The relative open channel noise of single channel currents and of the 1st and 2nd opening levels of multiple channel currents. The amplitude difference between 1st and 2nd level of multiple channel currents is insignificant. However, the noise of multiple channels (either 1st or 2nd level) and single channel currents is significantly different (p > 0.05, t-test). However, the binomial test is not a stringent test of cooperativity, especially for relatively small deviations. Binomial tests do not contain any kinetic information, only equilibrium information. As Horn  pointed out, the binomial distribution is no better a statistical predictor for the number of active channels in a patch than is the maximum observed level. A better test of independence is to ask whether events are correlated in time, since that utilizes both amplitude and duration information. That analysis is discussed later in the paper. 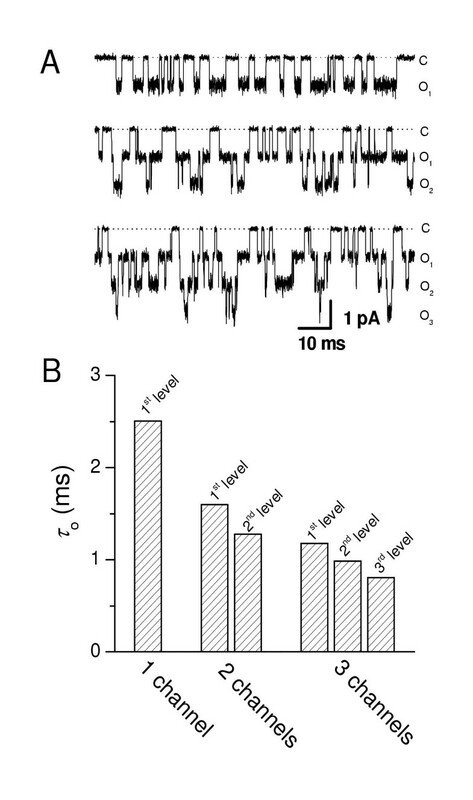 Figure 2 shows multiple channel currents activated at different concentrations of ATP (A) and the peak-current dose-response curve (B, Circles). In order to compute the mean response from multiple channel currents, the dose-response curves were normalized to the current activated by 50 μM ATP and fit with the Hill equation. This yielded an EC50 of 9.8 ± 0.8 μM and a Hill coefficient of 1.9 ± 0.29. Figure 2B also shows the dose-response curve of single channel currents (Diamonds), fit with a Hill coefficient, EC50 and p o,max of 2.3 ± 0.44, 11.2 ± 1.0 μM and 0.61 respectively . These parameters depend on the molecular rate constants in the reaction pathway. The similar values of EC50 and Hill coefficient of multiple channel currents and single channel currents suggest that the rate constants along the activation pathway had changed in a compensatory way. However, we do not know the absolute value of p o in multiple channel currents and had to normalize the data of a single channel. We might assume that rate constants in the activation pathway are similar in single channel currents and multiple channel currents since both have a similar EC50 and Hill coefficient. Because we saw clusters of openings, we presumed the dominant effect might be on the closing rates associated with aggregation. Earlier kinetic analyses of single channel currents suggested that there were at least three binding sites (four closed states) in the activation pathway . Although the presence of aggregated closed states complicates the kinetics of multiple-channel currents, the mean open channel lifetime can be computed without explicitly considering the four closed states. By comparing the mean open lifetime of single channel currents and mean open lifetime of each level in multiple channel currents, we can determine whether the mean closing rate (i.e. the inverse of the mean open time) is affected by channel interactions. We obtained the lifetimes of different current levels from idealization of the currents using the program SKM http://www.qub.buffalo.edu. Our previous study demonstrated that the mean open lifetime was independent of ATP concentration . Figures 3A and 3B show currents from a single-channel and a two-channel patch (upper panel) with the idealized currents shown above the raw data, and their amplitude histograms below. From visual inspection we can see that the open times of the currents from the two-channel patch are much longer than those from the single channel patch. We analyzed the mean open times of currents containing one, two, or three channels in the patch and these are plotted in Figure 3C. The mean open time of a single channel patch is 2.50 ± 0.67 ms (n = 6), while in the multiple channel patches mean open time of each level is longer; opposite to the behavior expected for independent channels. With independent channels, a given state lifetime should decrease when more channels are available to change state. The increase in mean open lifetime with channel number in the patches is consistent with our observation of a trend toward positive deviations from the binomial distribution (Fig 1C). C represents both channels closed, O1 one channel open, and O2 both channels open. Then, the lifetimes of C, O1 and O2 (designated as τc, τo1 and τo2) are 1/2α, 1/(α+β), 1/2β, respectively. This indicates that the lifetimes of O1 and O2 for two independent channels should be smaller than O in a one channel patch (Scheme 1) due to the multiple channel openings. This prediction is opposite to our observations. We further tested this conclusion with simulations. We simulated currents assuming α = 250 s-1, and β = 400 s-1 in Scheme 1. The theoretical lifetimes of the closed and open states are 4 and 2.5 ms, respectively. We simulated the currents with one, two, and three independent channels and calculated the mean lifetime of each level (program MIL, http://www.qub.buffalo.edu) (Figure 4). The mean closed and open lifetimes calculated for a single channel are 3.92 and 2.51 ms, close to theoretical values. For simulations with two independent channels, the recovered lifetimes of closed level, 1st and 2nd open level were 2.09, 1.60, and 1.28 ms respectively, for levels 1, 2 and 3, close to the theoretical values of 2.00, 1.54, and 1.25 ms. The mean open times decreased with the number of channels (Figure 4B). The simulation results for independent channels are those expected from theory, but opposite to our observations with multiple channel currents (compare Figures 3C and 4B). Although Scheme 1 is the simplest possible kinetic model, the same general behavior applies to more complicated kinetics . The dramatic increase in mean open time of channel with multiple channel patches indicates that some kinetic property is different from single-channel patches. Simulated currents containing one, two, three channels, and mean times of each open level. (A) Simulated currents containing one (top), two (middle) and three (bottom) independent channels. We used a two state model (Scheme 1) with α = 250 s-1, and β = 400 s-1 to simulate the currents. The simulated currents were sampled at 100 kHz and filtered with a digital filter of 10 kHz. The mean closed and unitary current amplitude set to 0 and 1 pA respectively. We set the standard deviation for closed and open level of 0.1 and 0.3 pA to mimic the large open channel noise of P2X2 receptors. Oi represents the nth open level for multiple channel currents. (B) The mean times of each open level from 5 s of simulated data. We did a more global test of cooperativity by directly comparing cooperative and independent models using a maximum likelihood technique. If two binary channels were active, there would be three distinct current levels. We can model this with Scheme 2 with the constraints imposed by independence (above), or Scheme 2 without any constraints on the rates. If one assumes the number of channels is known, the unconstrained version of Scheme 2 has two extra parameters. If the unconstrained version of Scheme 2 is more likely to explain the data than the constrained one, the cooperative model is more likely. We fit several data sets with the two models using the maximum interval likelihood program MIL http://www.qub.buffalo.edu, and in all cases the likelihood ratio of the cooperative/independent model was >140, far in excess of the amount expected for the extra degrees of freedom. This strongly favors the cooperative model. In other words, the likelihood of observing multiple level events occurring so close in time is unlikely to occur with independent channels. We have observed an interesting phenomenon that relates to channels having different properties. When there is more than one channel in a patch, as expected, the open channel noise is higher than in single-channel patches. However, the open channel noise of each level in multiple channel currents is the same (c.f., Figure 1 and Figure 3D)! The relative open channel noise (σex,n/i, where i is the amplitude of a single channel) at the 1st and the 2nd level is 0.29 ± 0.01 and 0.30 ± 0.04 (n = 4) (Figure 3D), the 3rd open level has a similar value in multiple-channel patches (see Figure 1), while in the single channel patch, it is ~0.67 ± 0.01 (n = 6) (Figure 3D and Table 1). The differences in relative fluctuations may be the consequence of faster closing rates in single channel currents than in multiple channel currents, so that some short events are missed and end up being classed as open channel noise . Note: The results were obtained from the all-points histograms in Figure 5. The relative excess open channel noises of single channel current are similar except the current activated by 5 μM ATP. This outliner is due to the low open probability that make the fitting of Gaussian distribution unreliable. The increase in open channel noise of single channel currents relative to multiple channel currents with equivalent mean conductances at the same bandwidth suggests the basic channel permeability properties are comparable. Apparently the interaction of the channels affects not only the main-state gating rates, but the substate transition rates that create the open channel noise. In some ligand-gated ion channels, such as ACh receptors, the agonist not only activates the receptors, but also blocks the pore as well [25, 26]. In order to test if ATP blocks the P2X2 receptors and affects open channel noise, we recorded single channel currents activated by different concentrations of ATP. Figure 5 shows the currents recorded from a single channel patch activated by different ATP concentrations and the corresponding amplitude histograms. The currents activated by different ATP concentrations have a similar mean amplitude i of ~3.5 pA and σex of 65~70% (from the all-points histograms, see parameters in Table 1). Therefore, there is no indication that ATP blocks the channel or influences the open channel noise. This is consistent with the idea that ATP, a strongly charged anion, would be excluded from a pore selective for monovalent cations [7, 18]. Open channel noise is independent of ATP concentration. 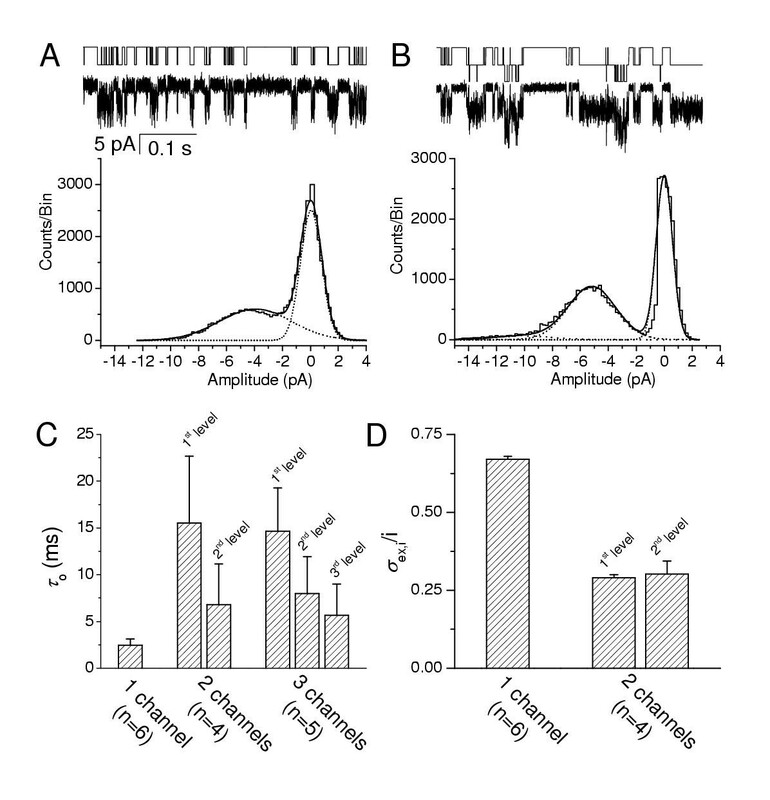 (A) Single channel currents recorded at -120 mV from a Xenopus oocyte activated by different concentrations of ATP as indicated in the figure. The data were filtered at 10 kHz and sampled at 40 kHz. The perfusion solution contained no divalent ions. All of the current traces in this figure are from the same patch. This patch contained one channel because there is no overlap of current in all the range of ATP concentrations. (B) The all-points amplitude histograms of the currents from panel A (0.05 pA/bin), with the distributions fit to the sum of two Gaussians. The dot, dash dot, and solid lines are the fits of open peak, closed peak, and the summation of two Gaussians. The fitting parameters are listed in Table 1. Our results demonstrate a clear discrepancy between the currents recorded from a single channel and those from multiple channel patches. Analysis of open channel lifetimes, open channel noise, and gating kinetics suggest that P2X2 receptors have non-independent gating behavior when multiple-channel exist in same patch, and P2X2 kinetics vary with the number of active channels, favoring positive cooperativity toward opening. While we found some discrepancies in the binomial distribution of occupancy, the deviations vary from patch to patch and are not convincing. The equilibrium binomial distribution is relatively insensitive to deviations since there is no time information . Yeramian et al  have presented kinetic models that have a binomial amplitude distribution but correlated lifetimes. The open channel lifetimes estimated for multiple channel currents are longer than those expected from single channel currents (Figure 3C), a trend opposite to that expected from independent channels (Figure 4B). The observed increase in open lifetime in multiple channel patches suggests the effects of interaction may primarily be on the closing rate. Therefore, the p o of multiple channel currents may larger than that of single channel currents. The channel closing rate may be dependent on the conductance state of neighboring channels via ionic fluxes or by direct interactions. The open channel noise of multiple channel currents is smaller than single channel currents, adding to the collection of properties altered by interactions (Figure 3D). It is not clear whether the differences in open channel noise arise from direct interactions between the channels or possibly differences in the membrane surrounding the channels, a phase separation. Based on our earlier studies of open channel noise , it doesn't appear that the reduction in noise is a result of accumulation (or depletion) of ions due to ionic fluxes. The excess noise of a single channel current is independent of ATP concentration suggesting that ATP itself does not cause extra noise, and that local ionic depletion and accumulation are not the origin of the effect (Figure 5 and Table 1). Faster gating kinetics might increase the apparent open channel noise of single channel currents (Figure 3A and 3B) due to the limited bandwidth that turns missed events into excess noise. This is confirmed by our simulated data with the different closing rates, but the same opening rates. At the same bandwidth, faster closing rates, i.e., shorter open lifetimes, can increase open noise and attenuate the mean amplitude (simulated data not shown). Similarly, with the same open and closing rates, the open channel noise and the amplitude decrease with the decreasing bandwidth. The large open channel noise for the P2X2 receptors arises from conformational changes, not channel block . For currents from single channel patches, the ratio of open channel noise to the mean amplitude can be > 65 % (Figures 3D and 5, Table 1). The noise level is similar to that observed in the cyclic nucleotide gated channels , but is much higher than most other voltage and ligand gated channels. The "noise" may contain several subconductance states; however, a higher bandwidth/lower noise recording system is needed to resolve them. For simplicity we therefore assumed that there is only one (noisy) open state and the noise level correlates with the number of active channels. Channel interactions might occur if the local density of channels places them in contact. It has been suggested that sodium channels form dimers or trimers [29, 30]. From the strong cooperativity of Ca2+ channels, it has been proposed  that Ca2+ channels may also aggregate into clusters. For a steric interaction between nearest neighbors, the stoichiometry would seem to be limited to a factor of 4–5. While "cross-talk" between P2X and nicotinic receptors has recently been shown [17, 32, 33] our results indicate that P2X2 receptors themselves are not independent, but positively cooperative. Given the extensive expression of P2X receptors throughout the nervous system, direct channel-channel interaction may affect neuronal function. Cooperativity is one of the basic properties that characterize long term potentiation in a neuron . The positive interaction of P2X receptors may serve to steepen the synaptic response in much the same manner as having multiple ligand binding sites. P2X2 receptors were expressed in Xenopus oocytes by mRNA injection . In order to obtain outside-out patches with a single channel from Xenopus oocytes, we decreased expression by reducing the amount of mRNA from 50 ng to 25 ng, lowering the incubation temperature from 17 to 14°C, and shortening the incubation time to 16 hours. 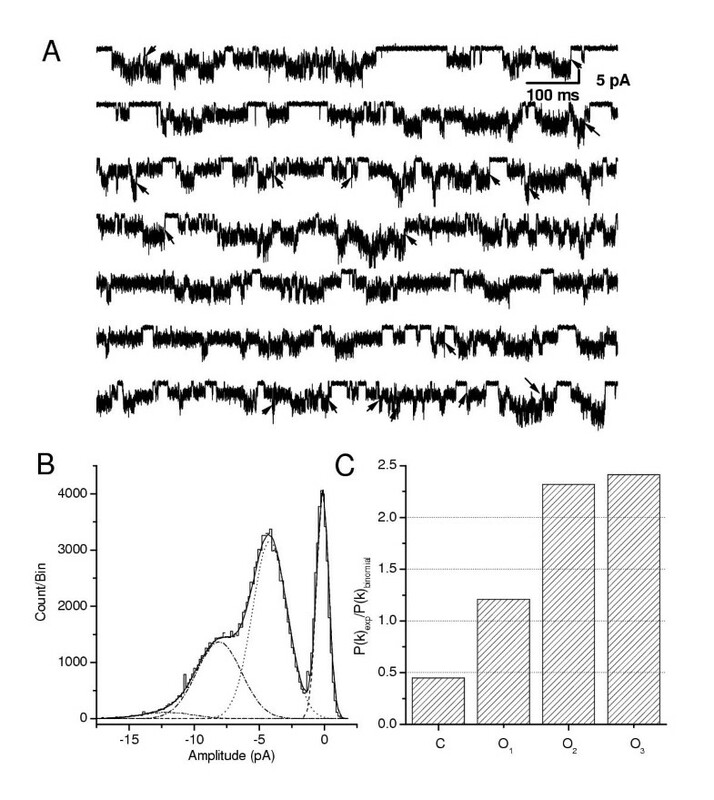 For electrophysiological experiments, Xenopus oocytes were cultured in the medium (ND96) contained (in mM): NaCl 96, KCl 2, MgCl2 1, CaCl2 1.8, HEPES 5, and was titrated to pH 7.5 with NaOH and sterilized by filtration. All chemicals were purchased from Sigma Chemical Co. (St. Louis, MO). Patch clamp recordings were made from Xenopus oocytes 16 hr after injecting mRNA at room temperature . Recording pipettes were pulled from borosilicate glass (World Precision Instruments, Sarasota, FL), coated with Sylgard, and had resistances of about 10 MΩ. The pipette solution for recording from Xenopus oocytes contained (in mM): 90 NaF, 5 NaCl, 11 EGTA, 10 HEPES at pH 7.4. The bath and control perfusion solutions were the same and contained (in mM): 100 NaCl, 2 KCl, 1 MgCl2, 1 CaCl2, 11 glucose, 10 HEPES at pH 7.4. The patch perfusion solutions were the same as the bath solutions, except for modified divalent and ATP concentrations as indicated for particular experiments. The perfusate was driven by an ALA BPS-4 perfusion system (ALA Scientific Instruments, NY). Currents were recorded with an AXOPATCH 200B patch clamp amplifier (Axon Instruments, Inc., CA), and stored on videotape using a VR-10A digital data recorder (Instrutech Corp., NY). The data were low-pass filtered at 5–20 kHz bandwidth (-3dB) and digitized at sampling intervals of 0.025–0.1 ms using a LabView data acquisition program (National Instruments™, Austin, TX). This calculation is insensitive to short events. In our initial analysis, we treated the channel as having two amplitude classes, open and closed. All rapid gating events associated with the open channel were treated as noise. Essentially we defined open as 'not closed'. p o can be estimated from the single-channel dose-response curve (Fig. 2B). We compared P(k) binomial with P(K) exp obtained from amplitude histograms of experimental data. A significant deviation of P(k) exp from P(k) binomial suggests either non-independence or nonidentical channels. Since the binomial analysis contains no kinetic information, different kinetic behaviors can produce the same distribution. The mean open lifetimes at each level were obtained from idealized currents using a recursive Viterbi algorithm known as the 'segmental k-means' (SKM) algorithm in QUB suite http://www.qub.buffalo.edu. In this method, the mean open lifetime is the average of all individual events at the same level. We used the program 'Simu' in QUB to simulate single channel currents. We would like to thank Drs. David Julius and Tony Brake (University of California, San Francisco) for providing P2X2 DNA. We thank Dr. Richard Horn for his insightful discussion. This work was supported by the NIH. SD carried out all experimental work and drafted the manuscript. FS conceived of the study. All authors read and approved the final manuscript.